Voltage regulators are of different types. In this article, our interest is only with IC based voltage regulator. An example of IC based voltage regulator available in market is the popular 7805 IC which regulates the output voltage at 5 volts. 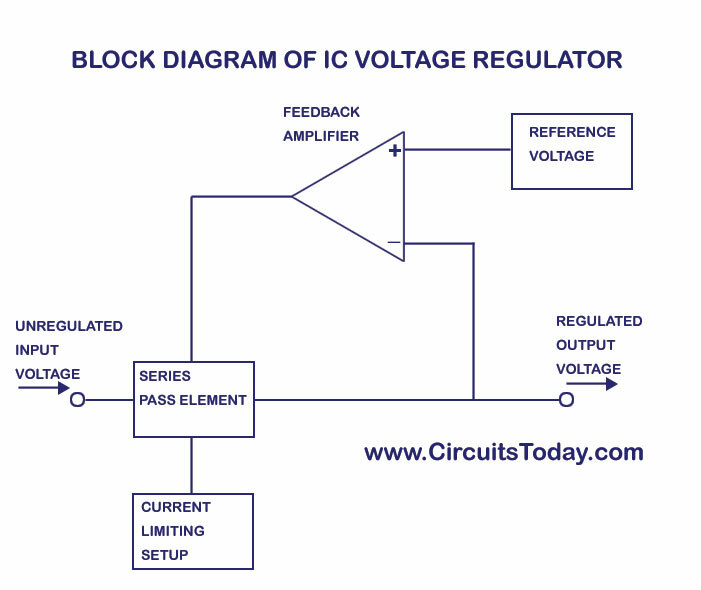 Now lets come to the basic definition of an IC voltage regulator. It is an integrated circuit whose basic purpose is to regulate the unregulated input voltage (definitely over a predefined range) and provide with a constant, regulated output voltage. We have given below the block diagram of a 3 terminal IC based voltage regulator. An adjustable voltage regulator is a kind of regulator whose regulated output voltage can be varied over a range. There are two variations of the same; known as positive adjustable voltage regulator and negative adjustable regulator. LM317 is a classic example of positive adjustable voltage regulator, whose output voltage can be varied over a range of 1.2 volts to 57 volts. LM337 is an example of negative adjustable voltage regulator. LM337 is actually a complement of LM317 which are similar in operation & design; with the only difference being polarity of regulated output voltage. There may be certain conditions where a variable voltage may be required. Right now we shall discuss how an LM317 adjustable positive voltage regulator IC is connected. The connection diagram is shown below. In this circuit, the value of Vref is the reference voltage between the adjustment terminals and the output taken as 1.25 Volt. In the above equation, due to the small value of Iadj, the drop due to R2 is neglected. The load regulation is 0.1 percent while the line regulation is 0.01 percent per volt. This means that theÂ output voltage varies only 0.01 percent for each volt of input voltage. The ripple rejection is 80 db, equivalent to 10,000. The LM 337 series of adjustable voltage regulators is a complement to the LM 317 series devices. The negative adjustable voltage regulators are available in the same voltage and current options as the LM 317 devices. This shows that the output of the regulator can be controlled by putting desired values for R1 and R2. The IC has a series pass transistor that can handle more than 1.5 A of load current provided that enough heat sinking is provided along with it. 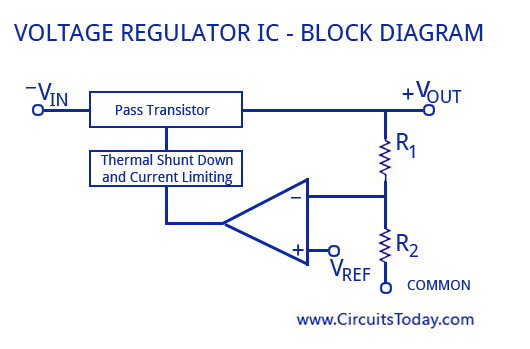 Like other IC’s, this IC also has thermal shutdown and current limiting options. Thermal shutdown is a feature that will turn off the IC as soon as the internal temperature of the IC rises above its preset value. This rise in temperature may mostly be due to excessive external voltage, ambient temperature, or even heat sinking. The preset cut-off temperature value for LM340 IC is 175Â° C. Because of thermal shutdown and current limiting, devices in the LM 340 series are almost indestructible. 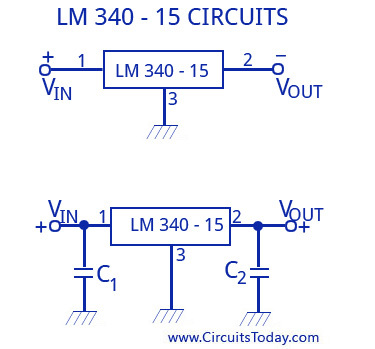 The figure above shows the application of LM340 IC as a voltage regulator. Pins 1, 2, and 3 are the input, output and ground. When there is quite a distance (in cms) from the IC to the filter capacitor of the unregulated power supply, there may occur unwanted oscillations within the IC due to lead inductances within the circuit. In order to remove this unwanted oscillation, the capacitor C1 has to be placed as shown in the circuit. Capacitor C2 is sometimes used to improve the transient response of the circuit. Any device in the LM 340 series needs a minimum input voltage at least 2 to 3 V greater than the regulated output voltage. Otherwise, it will stop regulating. Furthermore, there is a maximum input voltage because of excessive power dissipation. Switching regulators differ in design,construction & operation compared to linear voltage regulators. In switching regulators the output voltage is regulated by controlling the switching time of feedback circuitry (which includes a reference voltage); that is by adjusting the duty cycle.The regulators discussed above are all linear voltage regulators which need a series pass transistor to regulate in the active region. Though they are chosen for different purposes, they do have a disadvantage of high power dissipation of the series pass transistor. The main reason is because the series pass transistor is used as a Class A power amplifier which is known for its low efficiency and power loss in the form of heat. The series pass resistor will have to carry a heavy load when the load current increases. This causes the series pass transistor to get bulky with a bulkier heat sink. This in turn increases the overall cost as well. 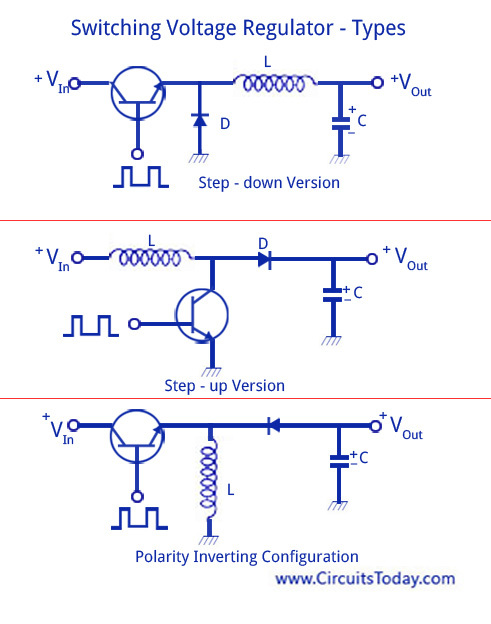 Such linear regulators will also need a step-down transformer which again increases the size of the overall circuit. The large ripples produced by the circuit should be eliminated and this requires large sized filter capacitors. All these problems can be solved by using a switching voltage regulator. The whole operation is completely different when compared to a linear voltage regulator. Here, the series pass transistor is not used as an amplifier, but as a switch. That is, instead of the transistor working in the active region, it is made to switch between the saturation region or cut-off region. Thus, the power dissipation is lessened and thus can carry heavy load currents at low voltages with less bulky heat sinks. Thus, this regulator finds its extensive use in personal computers. The basic switching regulator is designed to work in three configurations. Their circuit diagrams and explanation are given below. As shown in the figure above, the rectangular pulses are given to the base of the transistor. During each cycle of the pulse the transistor changes between saturation and cut-off. This creates a rectangular voltage at the input to LC filter. The ac components of the input voltage to the filter is blocked and the dc component is allowed to pass through the filter. As the transistor keeps switching, the average value will always be lesser than the input voltage. This is why we call it the “step-down” switching regulator. As shown in the figure above, the rectangular pulses are given to the base of the transistor. During each cycle of the pulse the transistor changes between saturation and cut-off.When the transistor is saturated the current flows through the inductor. When the transistor switches to cut-off a large voltage will be induced across the inductor coil because of the sudden collapse of the magnetic field around it. Thus the current keeps flowing in the same direction. The circuit is called a “step-up” switching regulator because the voltage induced by the inductor will be larger than the input voltage. As shown in the figure above, when the transistor is saturated, the current flows through the inductor. When the transistor switches to cut-off a large voltage will be induced across the inductor coil because of the sudden collapse of the magnetic field around it. Thus the current keeps flowing in the same direction.Since the transistor is cut-off, the only path is through the capacitor. If the direction of charging current through the capacitor is checked, output voltage is found to be negative. 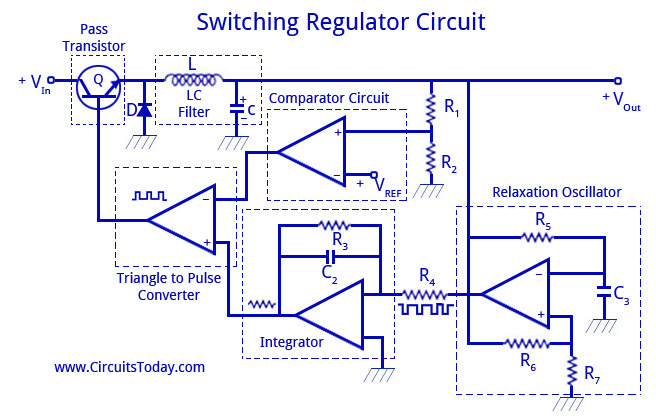 A simple switching regulator is designed with the mix of circuits that we already know. The working starts with the relaxation oscillator which generates a square wave. The frequency of the square wave is decided by the values of R5 and C3. The square wave is given as input to the integrator and produces an output triangular wave. This is given as input to the positive terminal of the triangle to pulse converter. The output pulse will then drive the base of the pass transistor. The duty cycle of these pulses will determine the output voltage. Since D can vary from 0 to 1, Vout can vary from 0 to Vin. A simple voltage divider is used to sample the output of the LC filter. This voltage is then fedback to the comparator circuit where a reference voltage Vref is compared with the output voltage and passed on to the negative input of the triangle to pulse converter. When the output voltage increases, the comparator circuit produces a higher output voltage and thus the inverting input of the triangle to pulse converter will have high value. This will narrow down the pulses at the base input of the pass transistor. Since the duty cycle is lower, the filtered output voltage is less, which tends to cancel almost all the original increase in the output voltage. It means that any attempted increase in output voltage generates a negative feedback voltage that almost eliminates the original increase. Reverse happens should the output voltage fall. Switching regulators are available in different configurations like the flyback configuration, feed-forward, push-pull, and non-isoÂ­lated single-ended or single-polarity types. Some of the common IC’s used as switching regulators in the above said configurations are the LM 1577/LM 2577 IC’s. These IC’s are designed by National Semiconductor. Both these IC’s are known for their minimum component fabrication, and simple to use facilities. These IC’s also have the advantage of internal frequency compensation and fixed frequency oscillator. Given below is the circuit diagram of switching voltage regulator using LM 2575. This IC is known for its high efficiency and will clearly replace all 3-terminal linear voltage regulators. The high efficiency of the IC can be obtained even without a heat sink. 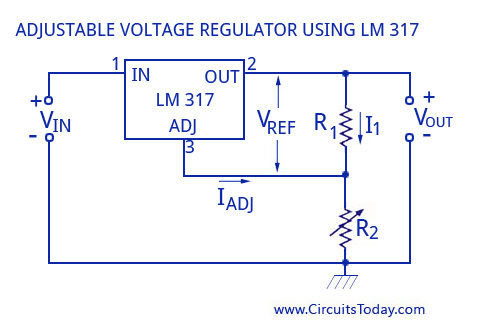 LM 2577 switching voltage regulator circuit diagram is given below. Both the IC’s are available fo different voltage levels like 12 volts and 15 volts and are adjustable. The LM 1578A IC was also developed by National Semiconductors and is used as a switching regulator for applications like dc-dc voltage converters, inverting configurations and buck-boost converters. The functional block diagram of the IC as a switching regulator is shown below. From the functional diagram we can see that the IC has a comparator circuit with an inverting and on-inverting input along with a 1 volt internal reference to each input, which clearly simplifies the circuit design and PCB layout. The IC is known for its flexibility in design by providing output pins for the collector (Pin 6) and emitter (Pin 5). The output of the IC can switch to a maximum of 750 milliAmps. According to the type of use of the IC, an external current limit terminal may be referenced to either the Ground terminal(Pin 4) or the the Vin terminal (Pin 8). The operating voltage f he IC can be varied from (2-40) volts. The IC is also enabled with current limiting and thermal shutdown capabilities. In addition, the LM 1578 A has an on board oscillator, which sets the switching frequency with a single external capacitor from < 1 Hz to 100 kHz (typical). Duty cycle up to 90 %. Multi tap ic chip with verying input voltage from 12 v dc down to 3vdc with option to tap in at a voltage output level to match less than 12 volts and usuable voltage down from this for low drain circuits, Prototype made at Bond university Gold Coast Australia. I’d like to also know about IC78C40 and the IC78S40 and their difference. I’ve been reading on them and i can’t seem to find the difference btwn them.